This image set is a study of a 3D-reconstructed 4 year-old female chinchilla presented to the Texas A+M Small Animal Hospital for CT (Computed tomography) imaging. Over 400 CT (computed tomography) images at 600 micrometer slice thickness were utilised for this series. 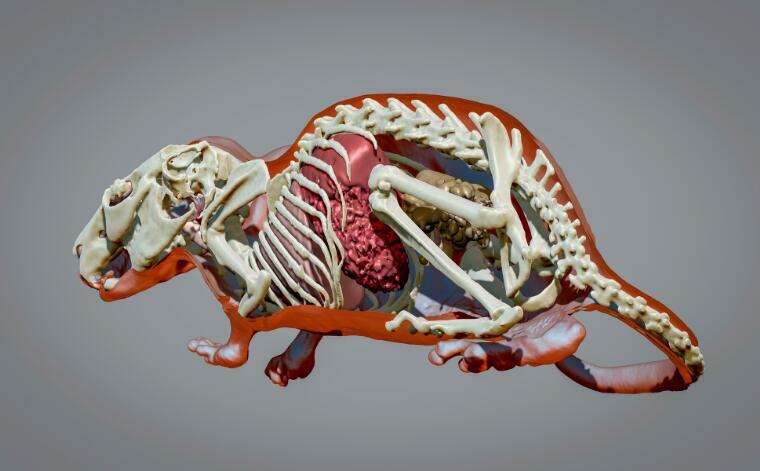 These 2D images were converted into 3D representations using tissue segmentation based on tissue density, resulting in Stereolithography (.STL) 3D models of the skeletal system and internal organs. The models were then textured and rendered to produce these images.